MANILA, Philippines - The November 2015 Philippine Bar Exam results were officially released online after the special en banc session on Tuesday, May 3, 2016. Out of 6,608 law graduates who completed the tests on the four Sundays of November 2015 (November 8, 15, 22, and 29), the full list of passers and topnotchers who got at least 75 percent average grade were announced by the Supreme Court (SC). 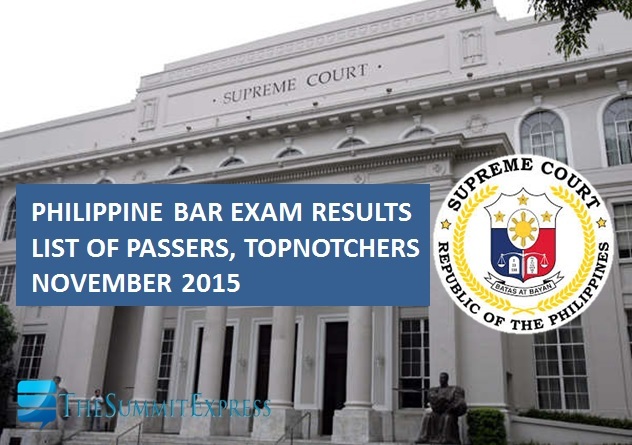 The Supreme Court announced that 1,731 or 26.21% of takers successfully hurdled the exam. Bar exams committee led by Associate Justice Teresita J. Leonardo-de Castro and the Office of the Bar Confidant conducted examination at University of Santo Tomas, Espana, Manila. The 2015 Philippine Bar exams have 100% essay-type questions based on the new guidelines. The SC said that from the 7,146 admitted candidates, only 6,619 left out on the first Sunday exams and 11 did not show up on the fourth week of examinations. The total number of examinees this year was higher than the previous exam. As a protocol, examinees were not required to explain their absence. In effect, SC has no way of knowing if the examinees fell ill or were simply overwhelmed by fear of the grueling exams. While a bar examinee is “deemed to have passed his examinations successfully if he has obtained a general average of 75%”, the Supreme Court en banc has always retained for itself (based on its authority to amend the Rules) the discretion to make adjustments, as it did in the 2012 Bar Examinations when it lowered the passing grade to 70%. In 2013 and 2014, the Court also lowered the passing grade to 73% in view of the structure of the results, the difficulty the candidates encountered with the MCQ portion of the exam, and in light of past precedents. The list of successful bar examinees will be flashed on a widescreen at the Supreme Court front yard and simultaneously be viewed at the official website of the SC. Same on the previous years, TheSummitExpress.com will update this site once we got important updates prior to the release of results. On this page, the list of passers and topnotchers will be posted. Once announced, the Bar passers may secure their clearances from the Office of the Bar Confidant during office hours, 8:00a.m. to 4:30p.m. on the specified date. March 1, 2016 Update: Reliable source says that results are probably out late April to early May 2016. March 11, 2016 Update: Supreme Court Associate Justice De Castro said on Thursday, March 10 during the 21st annual convention of the Philippine Women Judges Association (PWJA) that results are scheduled for release late April or sometime in May. The oathtaking for the passers of November 2015 bar exam will be on June 16, 2016 (Thursday). April 23, 2016 Update: Sources said bar exam results out on May 3. May 2, 2016 Update: SC prepares for the release of bar exam results. Special session to be held tomorrow, May 3. May 3, 2016 First Update: SC to release results at 1p.m. today - sources. May 3, 2016 Second Update: Bar exam results out! The Office of the Bar Confidant of the Philippine Supreme Court is tasked to release the Official List of Successful Bar Examinees, usually during the last week of March or the first week of April of every year. In the case of the 2014 bar exam, results were released on the fourth week of March or earlier than usual. From 2000 to 2006, the Bar exam passing rate exceeds 30 percent three times (in 2001, 2004, and 2006). After that, the passing rates saw a decline, with the rate going as low as 20.26 percent in 2010. For two years, results for MCQs weighed more (60 percent) than the results for essay questions (40 percent). But unlike in the 2011 results, the 2012 passing rate plummeted to a 12-year low of 17.76 percent. The following year, in 2013, the SC decided to change the Bar exam rules anew. This time, essay questions were made to weigh more (80 percent) than the MCQ (20 percent). That year, the passing rate recovered (22.18) but still far from the 30-percent mark in the early 2000s. Last year, bar passing percentage was 18.82 (1,126 out of 5,984) lower than the 2012 outcome. Irene Mae Alcobilla, graduate of San Beda College of Law Manila topped the 2014 bar exam with 85.50% average grade. Like Us on Facebook or Follow Us on Twitter to receive news related to November 2015 Bar Examination. Subscribe also on our E-Mail List via Feedburner.